Rhetorical question alert! Have you gotten on the social media bandwagon? How about Twitter Chats?! I’m thinking the percentage of those who answered “yes” to my second question may be less than the first! But don’t stress— I’m here to help you take that leap and fully engage in a Twitter Chat. And hey, guess what? (Another rhetorical question.) 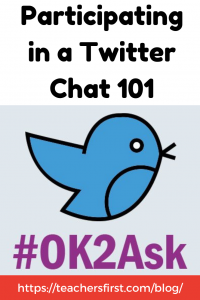 I’ve got just what you need… Our OK2Ask Team will be hosting a chat next week! So, buckle up, read on, and take the Twitter Chat leap! Avid social media use can truly transform professional development. You have shared resources, built in collaboration, and a network of subject area experts at your fingertips! I know participating in a Twitter chat can be overwhelming and intimidating, so I’ve come up with a list of steps to get you started! If you don’t, I would make your Twitter handle (user name) as professional as possible. 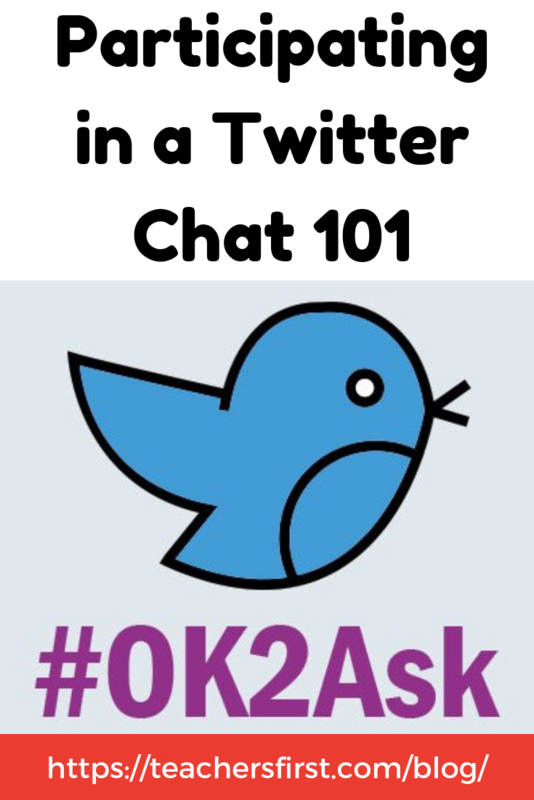 Once you find a chat you are interested in, and we hope it’s our (insert shameless plug) OK2Ask Twitter Chat, log onto Twitter on the date and time of the chat. All chats will have a hashtag (#) that they use so that participants will see the questions and responses. For example, our hashtag is #OK2Ask. If you type that into the Twitter search bar, you will see all tweets marked with that hashtag. This is by far the scariest step! When you’re ready, you can either click on the reply icon directly below the question tweet (all questions are abbreviated in the form of Q1, Q2, Q3, etc.) or compose your own new tweet to answer. All answers should be in a corresponding format to the questions (i.e.,/ A1 is the reply to Q1, A2 is the reply to Q2, and so on and so forth.). And don’t forget to include the hashtag (#), because otherwise, no one else will see your answer!!! Reply to, retweet, or like others’ responses. If you want to show someone that you agree with or like their response, you have a couple of options. Below their tweet, you can click one of 3 icons: reply, retweet, or like. If it’s your first chat, I’d simply start out with the “like” (heart) feature, because it’s quick and easy! Well, I hope you find my little tutorial helpful! Once you’re comfortable with these steps, there are many more advanced features and ideas you can run with… but start small! Have any lingering questions? Drop me a comment below! p.s. Check out our very own Twitter Chat Schedule HERE! We would love to have you!